Energetic Scorpio-Rooster does not tolerate boredom and inaction. It is rather difficult to please him: he is intolerant of human weaknesses, he recognizes only equal partnership. The Rooster-Scorpio is born to lead and guide people on the true path. It is distinguished by a proud temper, rather rude and categorical, but knows how to make a good impression. This is a very interesting, businesslike person with a difficult character. Here vanity, the unrestrained rooster of the Rooster and the sensuality of Scorpio combine, and as a result: a sea of ​​charm and ambition. On a combined horoscope, Scorpio-Rooster is a proud, ambitious man, endowed with an intuitive instinct and strong will. He has power over people, he wants to believe and obey all instructions without question. Charismatic Rooster-Scorpio makes a stunning impression: good-looking, charming, intellectually developed. Such a person can not remain unnoticed: always in the spotlight. Quite often people complain about the sharpness and incontinence of the Scorpio-Rooster, but still continue to communicate with him. To resist his charm is impossible, and besides, he is a partial person who is able to provide help and support. Although sometimes the Scorpio-Rooster overestimates himself too much and finds himself in embarrassing situations. He must learn to critically assess his capabilities and not take on impracticable tasks. However, there is no doubt that sooner or later the Scorpion Rooster will achieve its goal, even if nobody believed in its success. This courageous and staunch fighter will stop at nothing until he gets what he wants. Rooster-Scorpio has all the qualities of a leader: perseverance, dedication, determination. He has the gift of persuasion: he easily enthralls people with his ideas. Does not avoid responsibility, is not afraid to take risks. True, it is sharp, demanding: it does not forgive weaknesses and mistakes. The impatient Scorpio-Rooster hurries to get everything from life at once, so he can not wait for the rest. Is on another intellectual level, does not always understand others, but rarely condescends to explanations. This person is so self-sufficient and convincing that people admire him and try to help him in his endeavors in every possible way. Scorpio-Rooster loves and appreciates his friends, no less friendly to others. It is open to dialogue, does not avoid new acquaintances, with the big hunting travels. Mobile, active, does not like to sit in one place. His active nature does not tolerate peace and tranquility: he needs new impressions. At the same time, it is quite prudent and wisely manages its time and finances. In the life of the Rooster-Scorpio there are no serious surprises and troubles. This perceptive person does not just calculate the situation, but also anticipates future events. 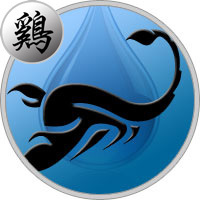 Such a Scorpio has a developed intuition, like all representatives of this watermark. Easily recognizes the mood of people, does not forgive lies and treason. Passionate Scorpios-Roosters are able to seduce: when they are just introduced, they begin to courting without any hesitation. On a love horoscope, Scorpio-Rooster is a sensual partner with powerful sexual energy. Completely represses and subordinates a chosen one or a chosen one. He can find a common language with a man ready to give way in everything. In return, it guarantees loyalty: Scorpio-Rooster is a gentle, sentimental nature, although it gives the impression of a hero-lover. For the Scorpio-Rooster family is a huge value, the most important achievement in life. He is immensely proud of his half and children. However, he is too zealous in his desire to protect them from all ills. Despotic, jealous and demanding — so he defends his role as leader. Close people should accept his position, because he cares about their welfare. Scorpio-Rooster is unselfish in relation to close people — nothing waits for anything, except subordination. I am willing to work hard for their own good, very generous towards them. Ambitious and hard-working Scorpio-Rooster sees himself only as a leader. Stubborn, proud, does not know how to obey — he reacts aggressively to any instructions. But hardworking, resolute and organized, able to achieve success in its field of activity. Especially if it takes care of its own business — it will work with enthusiasm and full dedication. It is distinguished by conscientiousness and honesty. Although he is harsh with respect to his competitors, he never wags intrigues against them. Enjoys the prestige of colleagues, has weight in business circles. Scorpio-Rooster easily avoids unpleasant situations at work. Acts quickly and decisively, not afraid to make bold decisions. He is distinguished by a developed intellect, strong intuition, therefore clearly defines the ultimate goal. The Rooster-Scorpio is not just picky about colleagues, but patronizes them. Although he does not forgive weaknesses, but tries to help, he often takes responsibility for someone else’s mistakes. For this person, a true fan of his business, there is no limit to perfection: he always achieves an ideal result. Strong Scorpios-Rooster men always get their way. They are honest and decent people, not prone to deception. Therefore, they are loved and appreciated not only by friends, but also by business partners. Responsibly related to the work, Scorpio-Roosters are men lucky in business, able to provide their family with everything necessary. They will create the most comfortable living conditions, the wife and children will be surrounded by love and care. But women should be prepared for the fact that these are quick-tempered, emotional people. With them it can be difficult, they make high demands on the chosen one. Will be happy with a kind, understanding companion of life, able to smooth out acute angles, to extinguish rare outbursts of rage. Woman Scorpio-Rooster — a person quite mysterious, full of contradictions. She loves and appreciates her family, she is ready to sacrifice much for the happiness of relatives. At the same time, a calculating, pragmatic woman who is not inclined to compromise. Establish relations with her is quite difficult, but her honesty can not be doubted. Until the last will defend her beliefs, it is very difficult to convince a strong-willed woman. Will be happy with a self-sufficient man who will not challenge her leadership ambitions. Scorpio-Rooster is a family woman, she is not interested in adventure on the side. This is a very caring and responsible mother, true, strict and demanding.